This past Saturday my wife I and I were anxiously awaiting the verdict of the trail for George Zimmerman, the man accused of shooting 17 year old Trayvon Martin. While this “trial of the century” was capturing America’s attention another story was unfolding in a Canadian hotel. Glee superstar and main man Finn, played by Cory Monteith, was found dead in his hotel room. We won’t know the cause of his death for several days but speculation abounds regarding substance use and suicide, a history of depression, etc. The horrible irony is that the writers for Glee have attempted to bring light to these and other issues that youth face on a daily basis. Update: Autopsy reports say the a combination of heroin and alcohol contributed to Cory’s death. No one can deny the impact Glee has had on youth culture over the last several years. At the very least it has provided a soundtrack for the lives of countless youth. More importantly Glee has given our youth a voice in a world where very few believe anyone is listening. I heard from countless teens who expressed a form of solidarity with the characters from the show. It had every stereotype one could imagine and they all found common ground singing for the lovable Mr. Schuester in Glee Club. It was here that they all found meaning and a sense of belonging. Glee Club became their refuge from a crazy world of bullies, expectations, pressure, stress, and the myriad of difficulties of being a teenager. They often spoke of Glee Club in transcendent language. I came to see Glee Club, as portrayed on the show, as a desire for a safer world in which youth can navigate the journey to adulthood, ripe with mentors willing to walk alongside them regardless of the personal cost. Glee changed the expectations young people had for their schools, homes, and relationships with each other. I’m wondering if, with Cory’s death, it will leave many of the show’s Gleeks feeling a sense of hopelessness that nothing they had come to believe in will actually make a difference. This could be soil for fruitful conversations about what is worth putting our hope and trust in. I have said to my wife during more than one viewing of Glee that I felt like these kids could be the kids from our community or youth group. Hearing about Cory’s untimely death impacted me emotionally and I wept upon receiving the news. 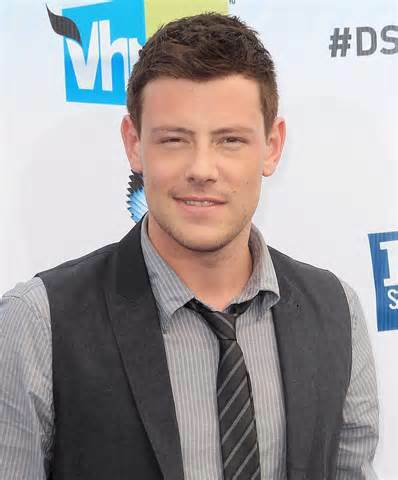 Finn, Cory’s character, was the arch-type male student, popular, pretty girlfriend, football quarterback, and could rock some Journey like no one else. I’m concerned about the level of celebrity worship in our culture. I’m concerned about its impact on our youth, who take their cues for living life from their idols, whether they’re conscious of it or not. This misplaced investment is fruitless and leads to despair. When a celebrity of Cory’s stature can’t escape the pull of destructive choices then what are the kids in our communities supposed to do? Glee struck a chord with young people like I’ve never seen before. It spoke of the things that no one else would speak about and they did it creatively and honestly. Many in the camp of Christianity wrote off Glee as obviously secular with an agenda but many failed to hear the messages of our youth that were reflected in the show’s storytelling. Weekly, the show masterfully addressed the deepest longing of our kids and one could hear it only they would listen. What if our youth ministries, what if our churches, what if our faith communities had the magnetic pull that Glee had for so many? I really believe that kids vote with their presence, meaning, if our ministries even remotely smell like the shallow offerings the world has to offer they will not partake of it. I believe in my core that youth will choose that which is most compelling. We love to blame the youth for being apathetic regarding their spiritual growth and commitment to their faith but what if it wasn’t them? What if it was our ministries? What if we created deep ministries, like Glee, where students who felt they weren’t wanted anywhere could find a place to belong? What if they were safe communities where they could let down their guard and be real and honest about the things in their lives that are important and troubling to them, issues like depression, stress, sexuality, self-injury, self-image, or their futures? What if they felt they mattered because we loved them in spite of what they do and not just because they jump through our hoops and fit our mold of what we think they should be? What if there were a number of adults who would commit to walking alongside them, regardless of how difficult it became? What if our ministries were places of real hope that pointed to the Source of all hope? How is it that Glee has been kicking our butts when it comes to influencing and reaching our kids? And I don’t buy the line, “Because it appeals to their fleshly desires” or what ever version of that sentiment might be. I think it is because it speaks to the longings that are most important to youth and it does so in a meaningful way. My heart is broken for Cory Monteith. It’s broken because in spite of the Glee’s efforts to create the world described above, it still falls short. Cory’s death is a reminder to us all that this world is broken and God’s children, apart from Him, are broken. It reminds me that when we seek the satisfaction of those deep longings apart from Christ the world will always come up short. I pray that our ministries are a place where the deepest longings of our hearts are fully satisfied through our ever growing relationship with Christ and His body. It is there and only there we might experience the Kingdom on earth, as it is in heaven. Really insightful commentary about how kids need communities and role models. Cory Monteith’s death was tragic and it was be very sad when they deal with the Finn Hudson character. I hope there will be ministers and other Christian leaders who can put this in context. I too am curious as to how they will deal with his exit from the show. They have a history of handling sensitive issues pretty well. It’ll be interesting to see how this plays out.